You know, we figured it was time to change the magazine a little, make it a little more modern and professional looking. So not only have we updated the cover logo, we have changed a lot of the interior design too. AND … for this re-launch issue we have increased the page count to 132 pages. That’s the same as Classic Rock: AOR was, but not only is FIREWORKS £2 cheaper, we have over 100 more album reviews and over 50 more free songs on our CD! Speaking of our CD we also have a 34 page PDF on there – so that’s 166 pages in total. All for £5.99! Crazy, right? We’ve added a few historical features from this issue. ‘Take 5’ will have our writers as well as established names in the business picking 5 albums from their collection that they reckon should have met with greater success. The first to delve into his collection is the wonderful Dave Ling, one of the most revered journalists of our genre. Future names will include veterans of the AOR scene such as Derek Oliver, Dave Reynolds and Kelv Hellrazer, as well as our very own Paul Jerome Smith. We’ll also be looking in detail at some of the unsung heroes in rock, those journeymen who have travelled far and wide lending their hard-earned skills wherever they go; Steven Reid covers the first subject of this new feature, guitarist Bruce Kulick. Elsewhere, Caesar Barton takes an in-depth look at Gotthard, highlighting which albums demand your attention, and which might not be so indispensable. 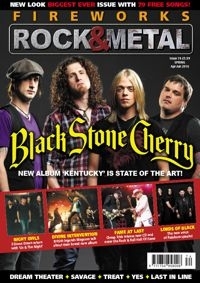 Of course, with 132 pages we have an enormous number of interviews, having detailed chats with the likes of Black Stone Cherry, Magnum, Cheap Trick, Last In Line, Tremonti, Nordic Union, 3 Doors Down, Dream Theater, Reckless Love, Treat, Yes, The Defiants, Metal Church, Johnny Lima, NWOBHM stalwarts Savage and an exclusive chat with new Rainbow vocalist Ronny Romero from Lords of Black! Oh, and not forgetting Rick Springfield, Rage of Angels, Drive She Said, The Treatment, Mute Gods, Monster Truck, The Wildhearts, Yes … and SO MUCH MORE! Your favourite melodic hard rock magazine just got BIGGER … and so much BETTER! Brand new look, more pages, interviews, reviews & 79 FREE SONGS: Let's ROCK!